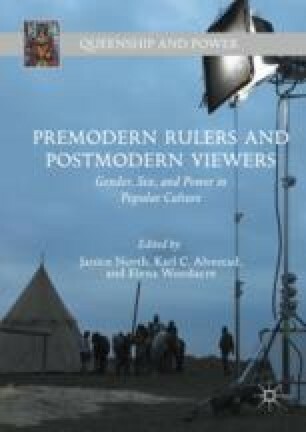 This chapter explores how Olaf II Haraldsson has been depicted in popular culture in Norway since 1945. Focusing its analysis of Olaf on the works of Vera Henriksen, Prima Vera, Stian Hansen, Olav Gullvåg, and Paul Okkenhaug, the chapter highlights how Olaf’s interaction with women around him, including his wife, challenge the notions of Olaf’s masculinity and its implication for him as a just and ideal king for Norway. This critique and reassessment of Olaf II give a significant insight into the relationship between the ideas about Olaf embedded in the Norwegian cultural memory and those found when encountering Olaf’s story as a man in modern texts on the big screen. Olaf is no longer just Rex Perpetuus Norvegiae—The eternal king of Norway. Bergan, Jon Vidar. “Prima Vera.” Store Norske Leksikon, February 19, 2014. https://snl.no/Prima_Vera. Friedlander, Whitney. “‘The Last Kingdom’s’ David Dawson on Learning His English History.” Variety, October 17, 2015. http://variety.com/2015/tv/news/last-kingdom-david-dawson-king-alfred-1201620614/. Hofstad, Sigurd, and Ugo Fermariello. “– Olav den Hellige var en massemorder.” NRK, July 23, 2014. https://www.nrk.no/trondelag/_-olav-den-hellige-var-en-sadist-1.11844595. Moland, Arnfinn. “Likvidasjoner i motstandsarbeidet.” Norgeshistorie.no, April 9, 2016. http://www.norgeshistorie.no/andre-verdenskrig/artikler/1734-likvidasjoner-i-motstandsarbeidet.html. Olavsfestdagene. “Om Festivalen.” Accessed July 19, 2017. http://www.olavsfestdagene.no/om/.